The Hope College Knickerbocker Theatre will show three films as part of its Summer Film Series from Monday, May 14, through Saturday, June 2. 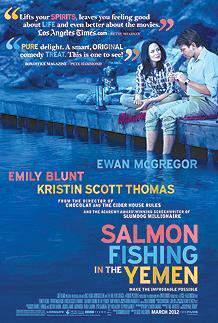 “Salmon Fishing in the Yemen,” which is a comedy from the director of “Chocolat” and the Oscar-winning screenwriter of “Slumdog Millionaire,” will show Monday-Saturday, May 14-19, at 7:30 p.m. A visionary sheik, played by Amr Waked, believes his passion for the peaceful pastime of salmon fishing can enrich the lives of his people, and he dreams of bringing the sport to the not-so-fish-friendly desert. Willing to spare no expense, he instructs his representative, played by Emily Blunt, to turn the dream into reality, an extraordinary feat that will require the involvement of Britain’s leading fisheries expert, played by Ewan McGregor, who happens to think the project both absurd and unachievable. That is, until the Prime Minister’s overzealous press secretary, played by Kristin Scott Thomas, latches on to it as a “good will” story. Now, this unlikely team will put it all on the line and embark on an upstream journey of faith and fish to prove the impossible, possible. The film is rated PG-13 and has a running time of one hour and 47 minutes. “The Kid with a Bike,” which was the winner of the Grand Jury Prize at the 2011 Cannes Film Festival and a Golden Globe nominee for Best Foreign Language Film, will run Monday-Saturday, May 21-26, at 7:30 p.m. The drama follows Cyril, played by Thomas Doret, an almost-12-year-old boy who has only one plan: to find the father who left him in a children’s home. By chance he meets Samantha, played by Cécile de France, who runs a hairdressing salon and agrees to let him stay with her at weekends. Cyril doesn't recognize the love Samantha feels for him, a love he desperately needs to calm his rage. The film is in French with English subtitles, and is not rated. It has a running time of one hour and 27 minutes. The final film in the series, “A Separation,” is the 2012 Academy Award winner for “Best Foreign Language Film,” the first time an Iranian film has won honor, and will run Tuesday-Saturday, May 29-June 2 at 7:30 p.m. Set in contemporary Iran, “A Separation” is a drama about the dissolution of a marriage. Simin, played by Leila Hatami, wants to leave Iran with her husband Nader, played by Peyman Moadi, and daughter Termeh, played by Sarina Farhadi. Simin sues for divorce when Nader refuses to leave behind his Alzheimer’s-suffering father. Her request having failed, Simin returns to her parents’ home, but Termeh decides to stay with Nader. When Nader hires a young woman to assist with his father in his wife’s absence, he hopes that his life will return to a normal state. However, when he discovers that the new maid has been lying to him, he realizes that there is more on the line than just his marriage. The film is in Persian with English subtitles, and is rated PG-13. It has a running time of two hours and three minutes. Admission to films at the Knickerbocker costs $6 for regular admission and $5 for senior citizens, and is free for Hope students. The Knickerbocker Theatre is located at 86 E. Eighth St. in downtown Holland. Additional information may be obtained online at www.hope.edu/arts/knick or by calling the Knickerbocker Theatre at (616) 395-7403. Beginning this July, Hope College will broaden its role as a national leader in the newly-emerging field of vocational exploration. A total of eight Hope College students have received Bultman Summer Research Awards from the college to conduct research at Hope in the natural and applied sciences this summer.